The General Services Administration (GSA) of the US Federal Government commissioned Michael Singer to design and implement a sculptural garden project for the Food and Drug Administration’s new Wiley Building in College Park, Maryland. The building is over 400,000 square feet and includes dozens of laboratories for food safety and nutrition research. The public art and landscape project encompasses a three-acre area south of the building that engages an existing stream, establishes a new wetland and pond habitat and activates the building’s courtyard green. The Healing Garden was created as a place where workers can seek respite within a quiet contemplative garden. While envisioned as a refuge the overall concept also attempts to restore and heal a part of the land that was heavily impacted by building’s construction. 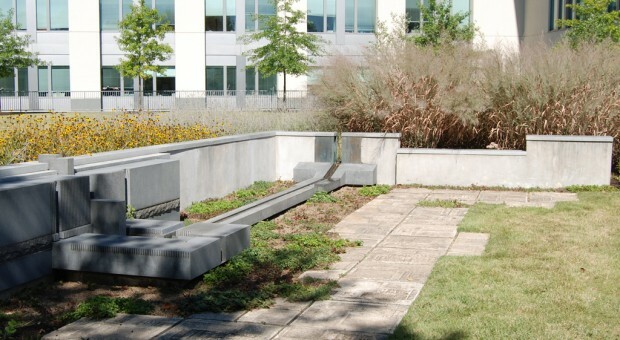 The garden consists of a series of low granite walls, benches and water elements set within the landscape of the building’s courtyard. The piece is framed by two water elements; the one to the southwest integrates a series of textured granite and bronze runnels that vary the sound of the flowing water. The other water element to the northeast has a hidden water source that pours into a spiral water well set into the earth. The two water elements, low granite walls and benches, planted gabions and terraces of sculpted pavers define the garden spaces that are overlaid with curving swathes of native and low water shrubs, grasses, wildflowers and succulents. Across the stream from the courtyard, the landscape was naturalized with dense vegetation and wetland and embankment plantings along a retention pond. Plants had to be carefully selected to handle the heavily compacted clay soils and minimal maintenance or irrigation. Trails of permeable stone fines connect the parking lots to the building and run along the stream connecting the adjacent metro station to other nearby properties.